UNDER TEXAS SKIES (1930, Syndicate) Bob Custer, Bill Cody, Lane Chandler, Tom London. A very rare, bizarre western thriller. Bob, Bill, and Lane are out to thwart London’s efforts to defraud an orphan girl of her fortune. Featured is an ape-like, mute giant who sadistically beats up Bill Cody and keeps him hostage for most of the movie. The creature’s scenes are shot with a “horrific” lighting style to add to his menace. From 16mm. THE SCARLET BRAND—Special 35mm Edition (1932, Big 4) Bob Custer, Betty Mack, Robert Walker. A wandering cowpoke is tricked by rustlers into appearing to work for them. He’s then cornered by angry ranchers and branded! After that, he sets out to prove his innocence and track down the rustlers responsible. A little creaky, but stil fun. From 35mm. MARK OF THE SPUR (1932, Big 4) Bob Custer, Lafe McKee, Lillian Rich. Bob is foreman on a tough cattle ranch. His boss thinks he’s soft though, and sends him into the bunkhouse where he locks horns with the ranch’s worst troublemaker. Bob falls for the boss’ daughter, but trouble erupts when her sleazy, long-lost brother returns home. Soon the payroll is stolen! Way above average for a Custer indie. 16mm. 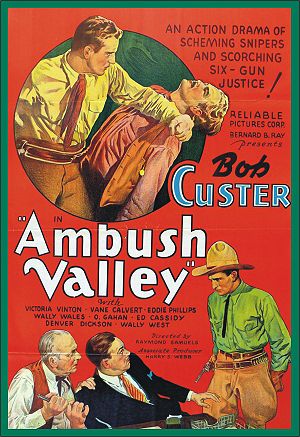 AMBUSH VALLEY (1936, Reliable) Bob Custer, Victoria Vinton, Wally Whales. A wealthy rancher opposes nesters on his land. In a showdown, the rancher kills a drunken nester whose mom swears revenge. Bob’s final starring film. From 16mm.